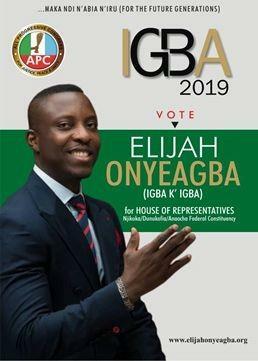 2012 Tutu Fellow, and representative of the All Progressive Congress(APC) in Nigeria, Elijah Onyeagba, has secured his party’s ticket to contest in the general elections as Member of Parliament representing Anaocha/Njikoka/Dunukofia Federal Constituency. Elijah is an Economist by training and has an MBA in Finance with over seventeen years’ experience in commercial, corporate, retail, mortgage banking, real estate, research, marketing and leadership. He is an expert in the structuring and advisory on construction finance deals with specialty in residential/affordable housing projects. He is currently the CEO of Countrywide Housing Company (CHC). “Participating in the political process is a starting point for anyone who wants to bring about a desired change. My goal is primarily to do things differently. I want to set a standard, I am organising town hall meetings that I tagged. I am taking note of the challenges in various communities. A careful understanding of these issues will go a long way to finding a solution. I am inclined to adopt a bottom-up approach to addressing issues from political perspective," he said. The Tutu Fellowship has been very instrumental in this journey, he said. "The burning desire to do things differently in governance was lit by the Fellowship and from thence, it was only a matter of time for me to get actively involved. I was part of the privileged 2012 set and the entire program from faculty to fellow participants made it a life-changing experience for me. I owe it to the Fellowship to ensure that I give back." Among the three contestants, he is the best among them both economically psychologically and professionally. For Nigeria to be Restructured and rebuild again, the youths must take over the government to make sure that things are in order. All these men governing Nigeria today has done it before at there youthful age, so it time for youths to take over the world. Among the three contestants, he is the best among them both economically psychologically and professionally. For Nigeria to be Restructured and rebuild again, the youths must take over the government to make sure that things are in order. All these men governing Nigeria today has done it before at there youthful age, so it time for youths to take over the world.